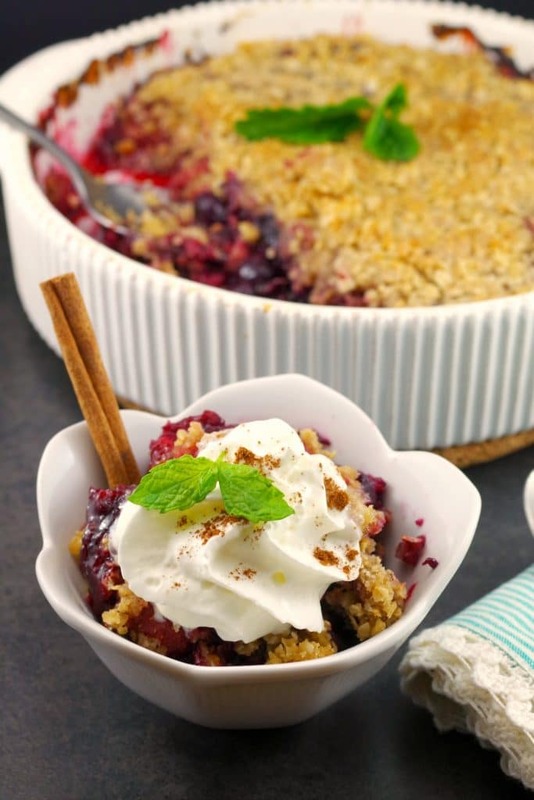 This Triple Berry Crumble is one of my favorite, quick and healthy dessert recipes. It’s a simple recipe that can be thrown together last minute for a potluck or holiday gathering. 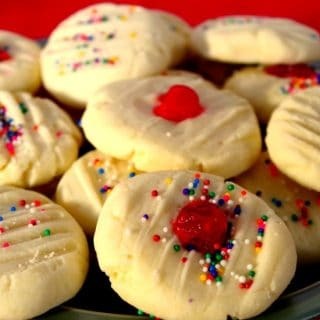 And it’s the perfect easy recipe if you are charged with bringing dessert but are short on time. This version is also a little different than your typical berry crumble. But rest assured, it’s also kid tested and has their seal of approval. And believe me, they are a tough crowd! But what’s the difference between a crumble and a crisp, you ask? Since you are wondering….the difference between crumbles and crisps is really nothing. The original difference between crisps and crumbles was that crisps would contain oats and crumbles would not. However, nowadays, they have basically morphed into the same thing and crumble and crisp are often used interchangeably. Now crumbles have been popularized in North America and are often associated with the deep south (United States.) The crisp, with the addition of the oats, is simply the Americanized version of a crumble. And for your information: crumbles and crisps have a streusel-like topping, while cobblers have a biscuit topping. The crumble has British roots and was promoted, along with cobblers, by the Ministry of Food during the Second World war, as they are filling, yet require less butter than a traditional pastry and can be made with margarine. So, whether you eat crumble or crisp these days, you’re pretty much getting the same dish. My crumble has oats, so if we were to get really picky, it’s technically a berry crisp (the Americanized version of the crumble). But that’s really inconsequential because it’s the same thing, it’s delicious and that’s all you really need to worry about! I make this crumble when I need something fast and simple and don’t even have time to go to the grocery store. This is made with staples that most people have on hand, like butter, oats and frozen berries. But I wanted a crumble that was a little different than the usual so I spiked this mixed berry crumble recipe with some fresh mint and lemon zest, as it gives it a nice fresh, unique taste. I have started growing mint, so I don’t even have to go to the grocery store for that! But if you don’t have any, it really is worth the trip to the grocery store. And mint tends to last longer than other fresh herbs, in my experience. Then I added some unsweetened coconut to the topping – this gives it a really nice flavor boost! 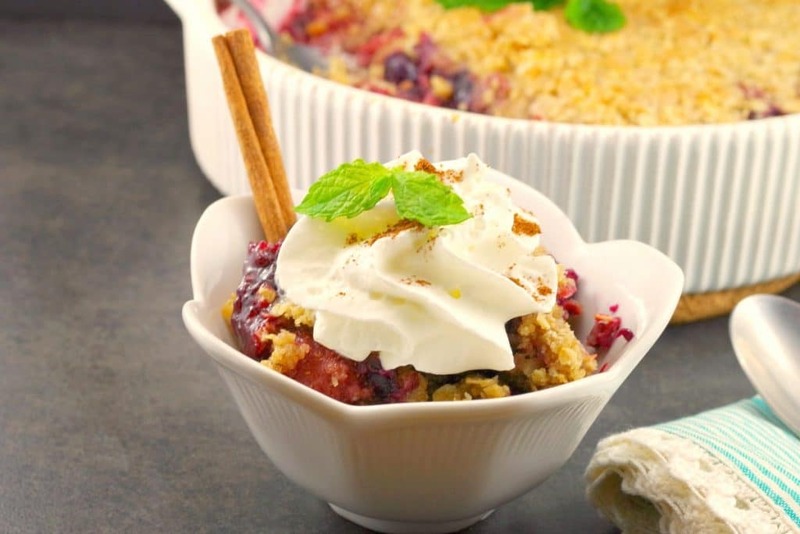 So, if you are not up for something overly involved, looking for a frozen mixed berry dessert recipe and need a delicious, quick and comforting dessert, then give this Healthy Berry Crisp Recipe a try. And if you are looking for additional easy, make-ahead and delicious potluck desserts, check out this recipe! Get the dish in the photo! This quick, easy and healthy Triple Berry Crumble is made with frozen mixed berries, so it's great for a last minute dessert because it uses ingredients you already have on hand (like butter, frozen berries and oats)! The addition of coconut, fresh mint and lemon make it unique and fresh tasting! Crumble topping: In a large bowl combine flour, brown sugar, 1/4 cup white granulated sugar, coconut, cinnamon, salt and oats. In a large bowl combine berries, 1/3 cup white granulated sugar, cornstarch, lemon zest and fresh mint ; toss to coat. Add berry mixture to casserole dish.Top with crumble topping. Bake until top is golden and fruit is bubbly, about 35 minutes. 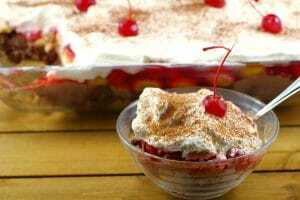 Serve warm and garnish with ice cream or whipped cream and sprinkles of cinnamon and/or cinnamon sticks and fresh mint! Yum! this looks so great, and light after all the holiday excesses. All those healthy berries, full of antioxidants in one tasty crisp! I love the addition of lemon and mint as a flavour boost! Thanks for sharing this yummy dessert! I love the addition of coconut to your berry crisp. And I also love your tip about grating the frozen butter. Life changing indeed! Hi Colleen. Thank you and YES the butter trick is the best, especially if you are a baker! This crumble looks really very delicious!! Thanks, Denise! I agree- I love making crumble all year ’round! 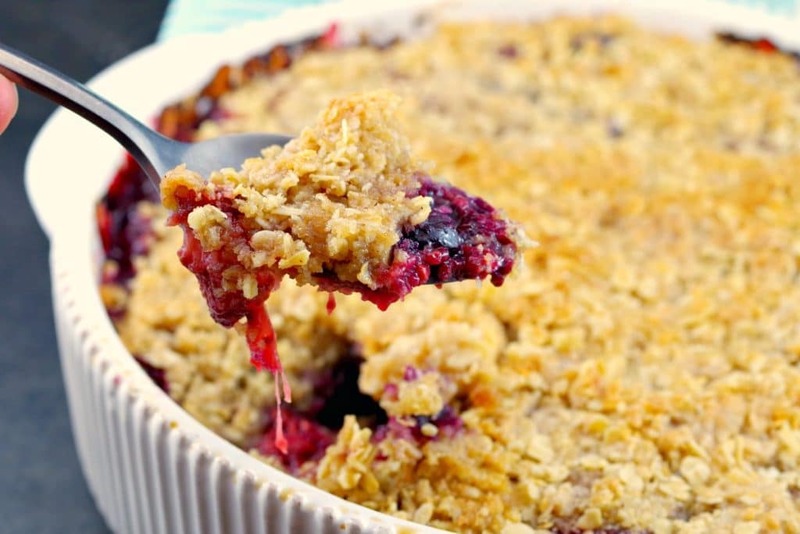 I love a good berry crumble (or crisp!) and this one looks delicious Terri! 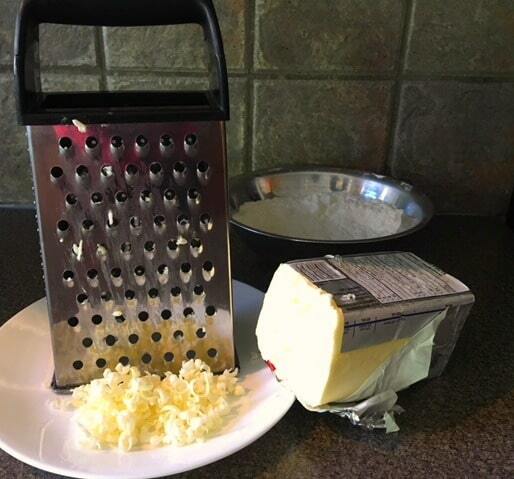 Great tip for grating the butter! I’ll have to try that some time!